Web: Some people work or study better in silence, and silence drives other people nuts. If you like background noise, Deepfocus helps you mix music with ambient sounds to help you stay focused while you work. 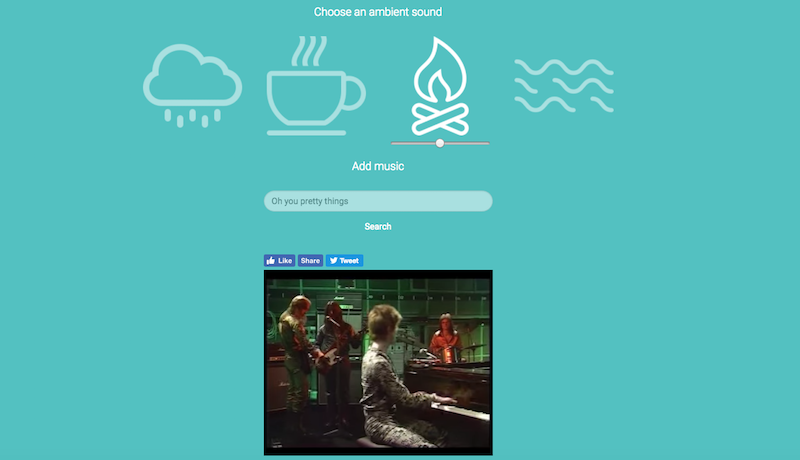 The free web app is a lot like the ambient noise apps we've covered in the past, but in addition to noise, you can play actual music, too. It comes with four built-in sounds: Fireplace, rain, coffee shop and wind. You can adjust the volume and mix and match those, but you can also search for specific music via YouTube, and the app plays it all simultaneously. Just type in a song, album or genre. You could mix Simon and Garkfunkel's Greatest Hits with coffee shop sounds. Or Rammstein with fireplace crackles — whatever works for you. Obviously, you can do this on your own, too. Just play your own music then use this app or any other ambient noise site to manually mix sounds. However, this makes it easy to do in one place, plus it's kind of fun. Give it a try for yourself at the link below.